It is a surprise that anyone over the age of 30 is still alive. After all, we lived in an era of wanton recklessness and crazy, risky games. For example, most of us at one time or another participated in either a sack race or a three-legged race. This year, teachers at the John F Kennedy Primary School in Washington, Tyne and Wear (a metropolitan county in Northeast England) decided that they would drop the two races for fear of injury to the children. Events in hopping, running and throwing (ping pong balls) will take place, but they thought that sack races and three-legged races were "far too risky." 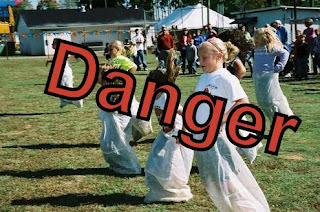 One school official is quoted as saying, "We looked at a three-legged race and a sack race but what we want to do is minimize the risk to the children... We had to assess which of the activities were liable to cause a risk. We thought we would be better to do hopping and running instead because there was less chance of them falling over." memo: make sure the kids are all equipped with knee pads and helmets for the hopping games. And don't keep score as that might ruin their self-esteem.